Ragi (naachini) is a cereal consumed as ragi mudde, ragi dosa or ragi roti in the state of Karnataka. 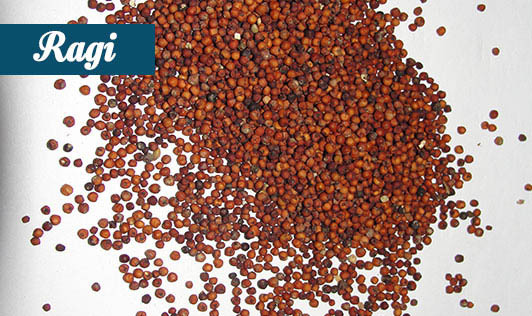 From times immemorial, ragi has been considered as an ideal food for all ages, especially infants. It has the highest calcium content among cereals, the amount being 344mg per 100g. Calcium is a vital mineral for the development of bones and also has numerous functions in the body. Ragi is very often recommended for those whose calcium requirements are high as in growing children, adolescents, pregnant and lactating women, and other bone disorders. It is also good for those having diabetes as blood sugar will rise slowly over 2 to 3 hours. This cereal is also a good source of fibre and iron. Ragi flour is high in fibre and can be mixed with wheat flour in a ratio of 1:1 to increase the nutritional value. Make ragi a part of your healthy diets.